« No Dearth of Dad’s Day Stuff! Though we’ve yet to play court jester and premiere our upcoming political piece before the President, we’ve still had a few nice shout outs in the media this month. Today the Los Angeles Times caught up with Scott Kirsner about his new book on digital businesses and we got a shout out thanks to Scott’s chapter documenting our business structure. 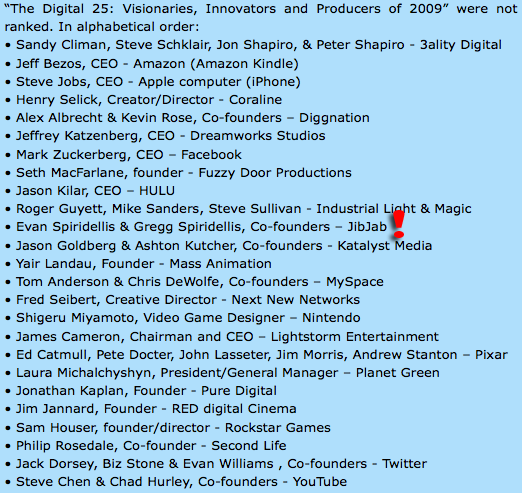 Plus, a few weeks ago the Producers Guild of America named us among the top 25 digital visionaries, innovators and producers of 2009! Wedged between Ashton Kutcher and Industrial Light & Magic, we’re in good company. Check the full list of talented peoples below! This entry was written by paulhanges and posted on June 16, 2009 at 6:11 pm and filed under Press with tags jib jab, jibjab, jibjab.com, Producer's Guild of America, Scott Kirsner. Bookmark the permalink. Follow any comments here with the RSS feed for this post. Trackbacks are closed, but you can post a comment. Sumbitch and hotdamn!!! Congrats Brothers Spiridellis!! Y\’all are in some mighty fine company. Hey, The Brothers Grim, Ashton Whatshisname and all those others folks listed above ain\’t got nothing on y\’all!!! WOOOOOO!! HOOOOO!!! !